IIS7 includes a comprehensive set of administration tools, including new administration and command-line tools, new managed code and scripting APIs and Windows Powershell support to simplify day-to-day tasks for developers and administrators. IIS7 includes the Microsoft.Web.Administration API for programmatically administering the web server. These managed code API makes it easy to programmatically provision, access important state and diagnostic information, or configure the server. The Windows PowerShell Provider for IIS 7.0 allows Web administrators and hosting providers to easily automate routine and complex IIS 7.0 administration tasks such as creating Web sites, and managing configuration and run-time data using Windows PowerShell. Administrators can further increase productivity by leveraging the many cmdlets included with the Windows PowerShell Provider for IIS 7.0. IIS7 supports a new command line tool AppCmd.exe - for administering the server. This powerful utility makes it easy to read and write configuration values, and access site and application pool state information, all from the command prompt. 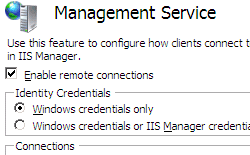 IIS7 also includes a new WMI provider which provides access to configuration and server state information to VBScipt and JScript writers. Using WMI, Administrators can easily automate basic configuration tasks like managing Web sites and applications.